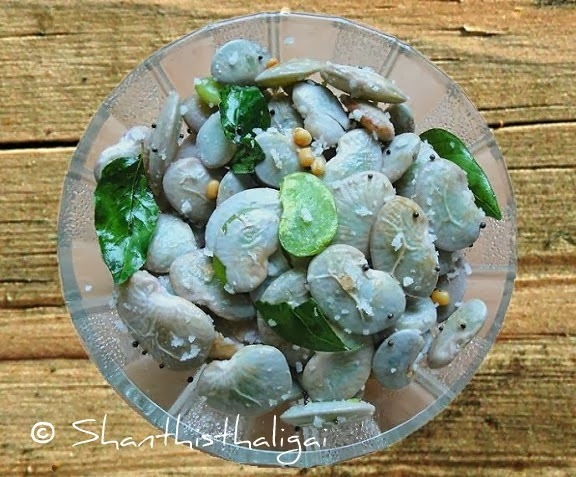 Cook fresh butter beans alongwith salt until soft. Drain the water completely. Heat oil and add mustard seeds, when they crackle add urad dhal, chillies, curry leaves and hing. Add cooked beans, scraped coconut and stir fry for a minute. Serve hot. I love this beans, they are so fleshy and yummy.. Healthy and tasty looking beans. புதுவகையான சுண்டல். பாராட்டுக்கள். பகிர்வுக்கு நன்றிகள். I have never had this before. Will try it out one day..